The famously popular southern dip is turned into a hearty entree salad. Texas Caviar Salad with Ham is super quick and tasty. You’ll wonder why you didn’t think of it! Not only is it now the holiday season, but it’s also the season for holiday leftovers. There’s two of us. Well, three if you count Missy, but we tried not to feed her too much human food. So. There’s two of us. The smallest turkey I could find? 12.5 pounds. That’s 6.25 of turkey PER PERSON!! Yes, I know that’s gross weight, but still! That’s two LARGE breasts. One fed the two of us AND had I leftovers for my lunch. That’s two LARGE thighs and drumsticks to make soup, enchiladas, tetrazzini, etc. So, for us it’s SERIOUSLY the season for leftovers. Not to mention, the left over ham that I found in the freezer the other day from Easter. Yeah, those don’t come much smaller. I can maybe find one around 9 or 10 pounds but that’s still an insane amount of ham for two people. One ham is at least 4 maybe 5 meals? Oh, and there’s still the ham bone in there, too, so that makes 6 total? Not bad, but still….S gets tired of eating the same things over and over. I planned a creamy chipotle chicken pasta for Thanksgiving eve, but I completely blanked and forgot to take the chicken out. He says to me, “Why did you plan a chicken meal the day before Thanksgiving?” “It’s chicken, not turkey.” Point taken. It’s poultry. So, I honestly have to be creative with the leftovers. Or, freeze them for MONTHS later and then go a freezer cooking binge. Like with the ham; the ham from this recipe and from the recipe that I posted earlier. It was freezer cooking time and I forgot I had that ham in there. I actually have one more package of ham that I may or may not make soup with. No, not bean soup. That’s what the ham bone is for. And honestly, I have a 13 bean soup mix from Bob’s Red Mill that I may use with ham bone. Hmm…now there’s a thought!! This recipe was born out of freezer cooker and pantry cooking. You see, I had this idea to make a Texas Caviar veggie burger. I know, it DOES sound good doesn’t it? But, I never got around to it. So, I had the cans of beans in the pantry for weeks when I stumbled on the ham. And I needed a salad recipe. Texas Caviar and ham and salad. BINGO! 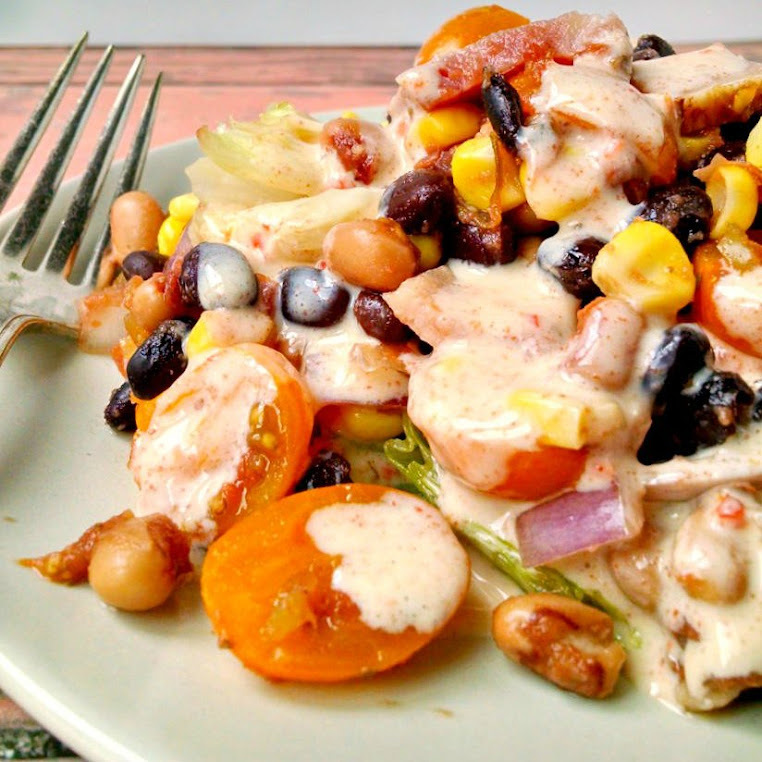 Throw in some DELICIOUS Fiesta Ranch dressing and it’s heaven on a plate! Honestly. Look at it and tell you don’t want to grab that fork, move it out of the way, and just dive in face first! Oh. It’s just me then? Whoops. This is pantry cleaning, freezer cooking, leftover deliciousness. Since it’s turkey leftover season, you could easily chop up some of that and throw it in there instead of ham. Roast beef? Yup! I bet that would be fabulous! Any way you serve it up, this salad is delicious! Your family will ask for leftovers when they taste this good. The famously popular southern dip is turned into a hearty entree salad. Texas Caviar Salad with Ham is super quick and tasty. You'll wonder why you didn't think of it! Combine the first ten ingredients (black beans through jalapeno) in a large mixing bowl. Set aside. Combine the salsa and the Fiesta Ranch Dip Mix with the yogurt, mayonnaise and milk. Set aside. Place one cup of romaine lettuce on each of four plates. Top with 1 1/2 cups of the bean mixture. Reserve any remaining mixture for another use. Place 3 ounces of ham on top of each of the four plates and drizzle with one fourth of the dressing mix.